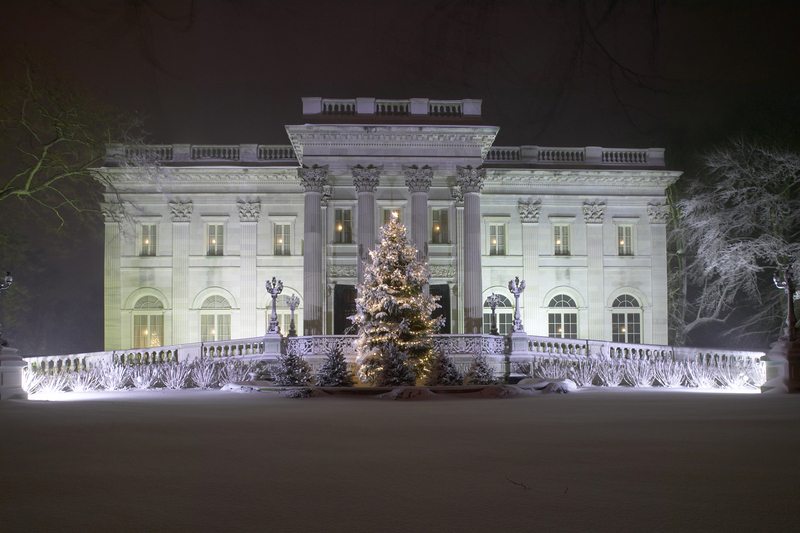 Once a year, when it’s Christmas time at the Newport Mansions, America’s Gilded Age comes to life, as bright and vibrant as it was during a bygone era, when the country’s social history was being made by names like Vanderbilt and Astor. The epicenter of this age was Newport, Rhode Island, where oil and steel magnates and robber barons built their castles, using stellar architects like Stanford White and employing the finest craftsmen money could buy. That heritage, spanning more than 250 years of American architectural and social development, stands today in the 11 homes known as The Newport Mansions, which are owned and administered by the Preservation Society of Newport County. The grandest of all, perhaps the one that best represents the Gilded Age, is The Breakers, a 70-room Italian Renaissance-style palazzo, built by architect Richard Morris Hunt in 1895 for Cornelius Vanderbilt II, president and chairman of the New York Central Railroad. French designer Jules Allard assisted Hunt with furnishings and fixtures; Austro-American sculptor Karl Bitter designed relief sculpture; and Boston architect Ogden Codman decorated the family quarters. The exterior, with its stone construction and massive Corinthian columns is as imposing as its owners intended it to be. The interior spaces total 138,300 square feet–yet the construction took just two years, an extraordinary feat in the 19th-century. As a time-saving technique, the Morning Room was one of two rooms created entirely in France by Allard. The Breakers incorporates Beaux Arts and Victorian elements and features rare marbles and gilded rooms (the gilt is 22K gold), a 50-foot high Great Hall, mosaic tile floors and ceilings, arcades and open-air loggias with commanding views of the Atlantic Ocean (the mansion is named for the crashing waves). In 2006, museum conservators at the Preservation Society of Newport County discovered that wall surfaces and ceiling panels were covered with precious platinum leaf. Originally, it had been assumed that the panels were covered in silver leaf—but then why hadn’t they tarnished in over 100 years? The conclusion, until 2006, was that the metal was probably tin or aluminum. That an individual had amassed such wealth as to cover his walls with precious platinum—Vanderbilt’s net worth at one point exceeded that of the U.S. Treasury—could only have happened in an age when there was no personal income tax. The original cost of the mansion has been estimated at between $7 and $9 million. Multiply that many, many times over to arrive at what it would cost to build the Breakers today, even if the craftsmen who created so many of its precious features could be found. Cornelius Vanderbilt II and his wife, Alice Gwynne Vanderbilt, had seven children. Their youngest daughter, Gladys, inherited The Breakers on her mother’s death in 1934. She opened The Breakers in 1948 to raise funds for the he Preservation Society of Newport County. In 1972, the Society purchased The Breakers from her heirs. Today, the house is designated a National Historic Landmark. Another of Newport’s grand homes is The Elms, an elegant French-style chateau, a copy of the Château d’Asnières near Paris, built in 1901 for Philadelphia coal magnate Edward J. Berwind. Standing in a 10-acre park with an elaborate sunken garden, The Elms has a grand staircase, fine parquet floors, ceiling paintings and elaborate moldings. But most remarkable is the stunning collection of monumental artworks collected by the Berwinds, including wall-sized 18th century Venetian paintings in the Venetian-style dining room and breathtaking Chinese lacquer panels. Although the Berwinds did not entertain on the same scale as the Vanderbilts, they did live well. Edward Berwind’s work kept him in New York much of the time, but he, like many of his fellow “cottagers,” traveled to Newport for weekends, either by steamer on the Fall River Line or aboard his own yacht, the Truant. Marble House, however, reflects only Alva’s insistence on perfection. She demanded—and got–authentically reproduced French design for her white marble palace and Hunt complied. Yet like their wealthy Newport neighbors, they spent perhaps six or seven weeks a year at Marble House, employing a staff of 36, including butlers, cooks, parlor maids, footmen, coachmen, gardeners and laundresses. For balls and large parties, additional help was brought in and decked out in the Vanderbilt maroon livery. Though it is difficult to imagine the lifestyle that Gilded Age wealth provided, a visit to the Mansions affords a glimpse: the imperial bathtubs at the Breakers, carved from single pieces of marble; the bronze relief of Athena over the door leading to the ballroom of the Elms; the 25-foot, six-oven stove in the kitchen of Marble House. The mansions are at their dazzling best during the winter holiday season (through January 2, 2017) when they are decked out in their most glittering finery. Staff and volunteers spend a full month filling the three houses with festive holiday decorations, matching colors and themes to the décor of individual rooms. 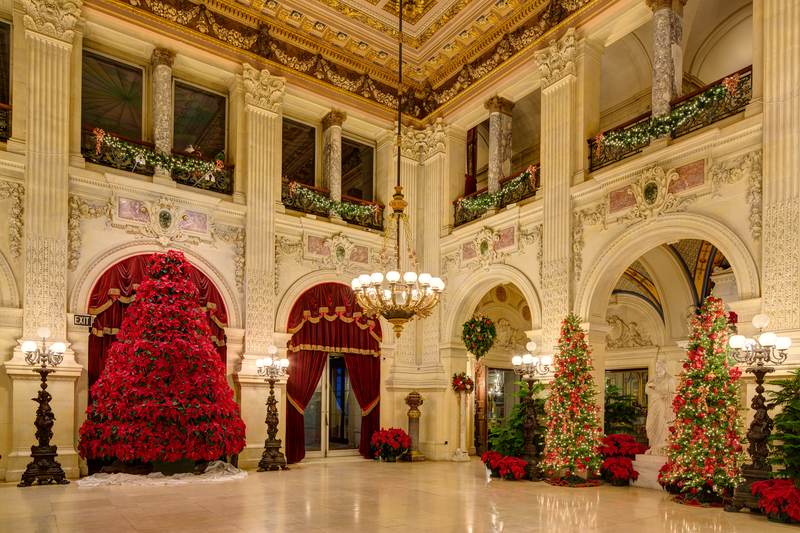 Some favorites return year after year, like the 15-foot-tall red poinsettia tree in the Great Hall of The Breakers, while each year new themes, ornaments and decorations are added to keep the experience fresh for returning visitors. Thousands of poinsettias, fresh flowers, evergreens and wreaths also fill the magnificent rooms. Each year new themes, ornaments and decorations are added to keep the experience fresh for returning visitors. For 2016, each house will get new, taller pre-lit commercial grade Christmas trees; there will be a total of 28 decorated Christmas trees throughout the three houses each decorated to coordinate with its setting. Thousands of poinsettias, fresh flowers, evergreens and wreaths also fill the rooms. Windows in each mansion are lit with individual white candles. New this year at The Breakers, the toy train display in the second floor loggia will focus on the Vanderbilts’ New York Central Railroad. Three model train sets, each different vintage reproductions of New York Central rail lines, will run through a grove of decorated Christmas trees. Nearby, display cases will exhibit memorabilia from the New York Central Railroad from the Preservation Society’s collection. Volunteers from The Little Rhody Division of the National Model Railroad Association will operate the trains on weekends and during Holiday Evenings at The Breakers. Among the three houses there will be 24 holiday-decorated mantelpieces, each with their own theme. At Marble House, eight regional garden clubs will decorate the fireplace mantels in the second floor rooms in a competitive challenge. Each club will be given a subsidy for materials, and their creations will be judged by certified flower show judges. Participating in the mantelpiece challenge will be the Barrington Garden Club, Bristol Garden Club, Newport Garden Club, Plum Beach Garden Club, Portsmouth Garden Club, Quononoquott Garden Club, Seaside Garden Club, and South County Garden Club. A fourth house, Rosecliff, is featuring an exhibition called “Splendor at Sea: The Golden Age of Steam Yachting in America.” Rosecliff was commissioned by Nevada silver heiress Theresa Fair Oelrichs in 1899 and designed by architect Stanford White, who modeled it after the Grand Trianon, the garden retreat of French kings at Versailles. After the house was completed in 1902 at a reported cost of $2.5 million, Mrs. Oelrichs hosted such entertainments as a fairy tale dinner and a party featuring famed magician Harry Houdini. More recently Rosecliff starred in several movies, including The Great Gatsby, True Lies, Amistad and 27 Dresses. Santa Claus will make a special trip to Newport from the North Pole to visit the houses in December. Children can visit with Santa Claus in a spectacular setting from noon to 3 p.m. at The Breakers on December 4, Marble House on December 11, and The Elms on December 18. The visit with Santa is included in the regular admission price. Admission to Holiday Evenings is $35 in advance, $45 day-of the event. Children 6-17 are admitted for $10 in advance, $15 day-of. Children under the age of 6 are admitted free. Preservation Society members enjoy reduced admission, $30 in advance, $35 day-of. 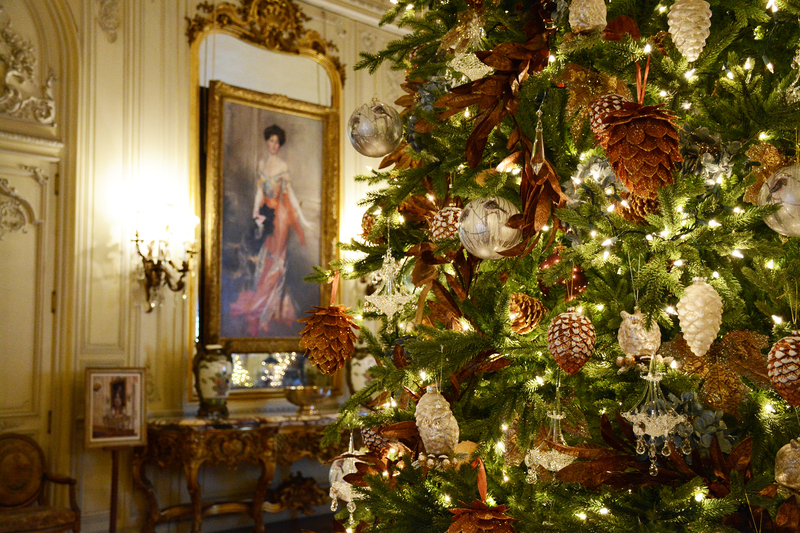 On December 17, a single ticket provides admission to The Elms and Marble House, as well as shuttle service operating between the two houses. More information, including the schedule of Holiday Evening entertainment, and advance tickets are available online or by calling (401) 847-1000. The shopping season at the Newport Mansions Stores gets underway with the annual Members’ Sale from November 17-20. The stores will also host book signings, food tastings and other shopping events throughout the season. For details, check the Events Calendar online. For special Luxe Beat VIP offers at The Breakers call 888.212.6444 or go to classictravel.com/luxebeatvip. Note: All photographs courtesy of The Preservation Society of Newport County.